How can a place evolve so much, how can you witness the pass of time by taking a glimpse at just one odd corner of your city? You can easily guess in this picture which building came first: yes, Casa Fajol also known as Casa de la Papallona (Catalan word for butterfly) dating back to 1912. Is it possible to combine historic buildings with a touristic resort and a leisure center? Well, our architects do think so, and who are we to contradict their expertise. 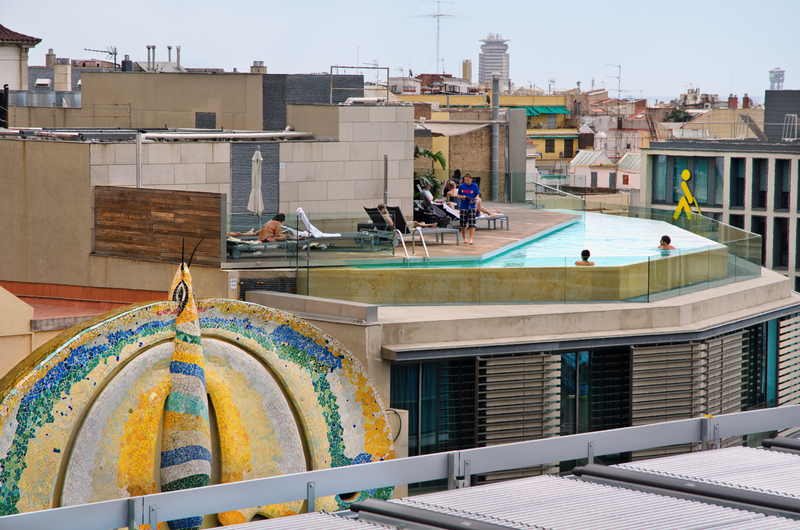 In 2005 they built a 3 star hotel (B-Hotel), with a fantastic swimming pool overlooking Plaza Espanya and Fira de Barcelona, that our butterfly almost touches with her antennae. That must be good for our visitors, a room with a view over our culture. But why not framing the whole scene from the platform of a brand new leisure center like Las Arenas literally rising over an old bull ring to really appreciate the clash of styles? Barcelona is the perfect spot. Disclaimer: This post is meant to bring debate over architectural topics, culture and the pass of time and is not interested whatsoever in what should have been done or who is to blame for such contrasts. Can you place a photo where you can see the hotel and Casa Fajol from the street with their facades because I think that where you are standing not many people will do. Of course there must be some kind of thought in building new against old and that must be in the public domain. Please check the sixth pic to the right. Hola, Carlos. Acabo de dar con tu blog buscando una foto de mi calendario (font de canaletes). Me encantaron tus fotos. Estuve de vacaciones en Barcelona hace 7 meses y me encantó tu ciudad. Desde ahora tu blog será visita obligada. Una pregunta: ¿qué novelas son clásicos reflejos del carácter catalán? Un abrazo. Milagros. from a different world. Still in itself the facade of the hotel is not really bad but total inappropriate to fitting the neighbour . Also the building on the arena is not fitting there in my eyes but perhaps nessecary . I don't know. Yes s.c, I think the hotel fits more or less although it could have been better and that Las Arenas is totally disruptive but it is much better that having a bull ring! That's a nice top view of pool. What a grand luxury this is. I think the butterfly is sort of out of place until you match it with the yellow figure on the other building. I think the architect did a great job of the pool placement.